We look forward to hosting you on our beautiful campus! 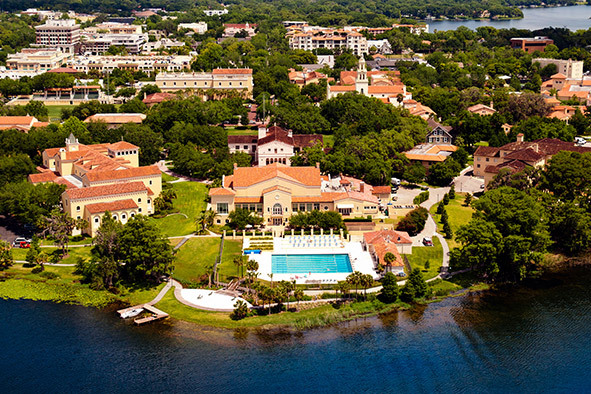 While you're here to see the production, take time to explore the beautiful Rollins College campus and enjoy a bite to eat in surrounding Winter Park. The Annie Russell Theatre is in the heart of campus, right next door to Knowles Memorial Chapel. We recommend that our patrons park in the SunTrust Parking Garage, located conveniently close to Rollins, between Comstock Avenue and Lyman Avenue off Park Avenue. If you are at the corner of Fairbanks Avenue and Park Avenue, locate the garage by traveling away from Rollins (north on Park Avenue). Make your first right at Comstock Avenue and the SunTrust Parking Garage is immediately on your left. The SunTrust Parking Garage costs $6 for four hours of parking. You are also welcome to park in any visitor spot you find on campus, or along Park Avenue. From I-4 East Take the Fairbanks Avenue Exit 87. Turn right onto Fairbanks and continue East for almost 2 miles. Turn left onto Park Avenue. Turn right on Comstock Avenue. The SunTrust Parking Garage will be on your left. From I-4 West Take the Fairbanks Avenue Exit 87. Keep left at the fork onto Fairbanks and continue east for almost 2 miles. Turn left onto Park Avenue. Turn right on Comstock Avenue. The SunTrust Parking Garage will be on your left. From S.R. 436 Turn west onto Aloma Avenue (heading towards I-4). Continue on Aloma Avenue for approximately 3 miles. Aloma Avenue become Fairbanks Avenue. Turn right onto Park Avenue. Turn right on Comstock Avenue. The SunTrust Parking Garage will be on your left. Once your vehicle is parked, exit the parking garage on the south side (the side closest to Rollins College). You will be approaching Fairbanks Avenue. There is a pedestrian crosswalk traffic light, which will guide you safely across Fairbanks and onto Rollins campus. Proceed onto campus, following the brick walkway. The Annie Russell Theatre is directly ahead on your right. We are committed to offering our patrons the highest level of customer satisfaction at the Annie Russell Box Office. Our box office staff is comprised of committed and energetic Rollins students, and managed by our Box Office and Marketing Manager, Chelsea Hilend. The Annie Russell Box Office is located to the left of the main doors of the Annie Russell Theatre. The box office opens 10 days prior to each production, and closes on the final day of each production. For detailed information on our box office, please click here. We offer handicapped parking in the Alfond Sports Center lot directly behind the theatre. Please allow your permit to show clearly in your windshield. 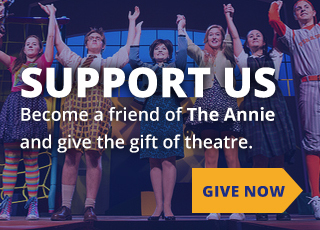 If you park in the SunTrust Parking Garage, you can take our shuttle, "Annie's Rapid Transit," to the theatre. Our shuttle stop is on the southeast corner of the garage, nearest the pedestrian crosswalk at Fairbanks and Interlachen. The Annie Russell offers two wheelchair access ramps into our theatre. They are located on the left side of the building, around the corner from the Box Office. One ramp takes you up in front of the box office, and into the front entrance of the theatre doors. The second ramp allows you to enter directly into the theatre seating area. You will require an usher’s assistance to access this second door, as it is only opened from the inside. In order for us to accommodate your seating needs, please make our Box Office staff aware of any special requests in advance such as wheelchair seating, or handicap accessible seating. We also have hearing assist devices for hearing impaired patrons. You may request these devices from the House Manager upon entering the theatre. Please allow yourself ample time for parking. There are sometimes multiple events happening on campus around us, so plan for possible congestion on campus roads and in parking lots. If you arrive late, please proceed through the Late Comers Entrance door, located to the left of the main doors of the theatre. Our House Manager will assist you to your seat at an appropriate moment. Please do not try to enter through the main front doors of the theatre once they are closed. We are pleased to offer concessions before our productions and throughout intermission. Our concession booth is to the right of the main doors, and is staffedand run by the Rollins Players student organization. Rollins Players is the student group that produces our Second Stage Series. They offer a variety of candy, sodas, and bottled water. Please be aware that no food or drink is allowed inside the Annie. There is a variety of fine restaurants and shopping experiences in the area surrounding Rollins College. Click here for more details.